Connsider the common nativity scene. There is a manger with Mary hovering over the babe; Joseph is standing nearby; a short distance away shepherds with their sheep and cattle gaze from snowdrifts. Three figures of royalty approach carrying gifts of various types; their camels patiently wait off to one side. A huge star shines from a tin reflector overhead. This scene will be pictured in many cities, churches, and homes this coming Christmas season. Perhaps the most obvious mistake in this popular rendition of the Messiah's birth is that the three figures representing the wise men from the east are coming to a manger. Matthew 2:11 plainly says that the wise men came to a house and saw the young child. Notice, the Son of Miriam was no longer in a stable, and He is now called a child, not a babe. Another error in our scene is that the Bible nowhere says that the shepherds saw a star, for the star was the sign given to the wise men. The wise men saw the star about two years later, because Matthew 2:16 tells of Herod's slaying all the young children from two years old and under in his wholesale effort to include Yahshua in his edict of death. Therefore, almost two years had elapsed since the birth of the Messiah. Not only did the shepherds not see the star, but the wise men were also not present to hear the angelic host make the announcement, for they had to follow a star to find Him. There is nothing in Scripture that states there were three wise men. There could have been 33. Merely because the wise men presented three gifts of gold, frankincense and myrrh, tradition holds that there were three of them. They have even been given names, although the Bible does not name them. If these nativity scene blunders were the only errors in the Christmas celebration, perhaps they could be corrected. However, tradition is strong, and even when these simple misconceptions are pointed out to people, they choose to continue on their way. Most of the world insists on keeping this festival not scripturally commanded. We are commanded, however, to remember the Messiah's death, 1 Corinthians 11:25. Instead of remembering His death once a year at Passover, the world celebrates annually what it thinks is His birth in the dead of winter in the northern hemisphere. Each year as the Christmas season approaches, newspapers are full of historical evidence showing how the customs surrounding this season all sprang from paganism. Jeremiah warns us, "Learn not the way of the heathen," Jeremiah 10:2. Anyone perusing his newspaper will find numerous articles showing that many of the customs of Christmas have roots in pagan practices. Bible scholars know full well that the Messiah was not born anywhere near December 25. Yet, when this is pointed out to people, the answer is that we really should not care when He was born, just so long as we keep a day in memory of His birth. Yet, just why we should be celebrating a day that has its roots in paganism is summarily shrugged off. Any good reference work will confirm the pagan origins of the customs of Christmas. Special notice should be given the following: Wassailing bowls were used by those observing the Bacchanalia to the deity Bacchus in Greece and Rome. Mistletoe was used by the ancient Druid priests as a symbol of pardoning of sin. A kiss was evidence of reconciliation. Reindeer can be traced to the Scandinavian mythology of Odin's horse Sleipnir, the fleetest horse in the world with his eight legs. In The Two Babylons, Alexander Hislop shows that the yule log is the dead stock of Nimrod deified as the sun-god, but cut down by his enemies. The Christmas tree is the slain deity come to life again. Yahweh warns against erecting Christmas trees in Jeremiah 10:2-5. Christmas cookies trace to pagan Babylon and Egypt where round wafers of the sun were ingested, signifying the partaking of the ''unconquerable sun" into their lives. The holly wreath, with its circular design and a candle or light within, memorializes sun worship. There is no doubt that Christmas, along with many so-called "holy days" in Christianity, has its roots in paganism. But the truth about Messiah's birth is not so well known. Rather than December 25, the Savior was more likely born in late September or early October. Luke 2:8 tells of the shepherds in the open fields near Bethlehem watching their flocks at night. Shepherds would not have their sheep on cold, rain-lashed hills in December. Scripture shows that December is a cold, rainy season in that region. Ezra 10:9 speaks of those in Jerusalem sitting outside in early December trembling because of their deeds and in "great rain." Winter weather did not change much from that day until the Messiah's time. Shepherds took their sheep into the open fields just before Passover in the spring and brought them in again during the Hebrew eighth month ‒ about the middle of November ‒ when the rainy season began. This is according to Henri Daniel-Rops' book, Daily Life in the Time of Jesus. The sheep were in their folds during the winter months, not out in the fields, and certainly not out in the snow. In view of these clear facts, how did December 25 become the celebration of the birth of our Savior? The World Book Encyclopedia says that in 354 CE, the December date was selected by Liberius, a bishop of Rome, "because the people of Rome already observed it as the Feast of Saturn, celebrating the birthday of the Sun." Other sources show that this day was the Saturnalia, a festival of much revelry, dancing, merriment, and feasting. A king was appointed over the revels. Slaves were freed. Foes became friends. Friends feasted together. Evergreens decorated the houses. Songs were sung in honor of Saturn. Gifts were exchanged between friends. All of this began 2,000 years before the birth of the Messiah! This act was to represent the sun running from the sky, for according to the idolatry of pagan Germans, the sun was a large fire-wheel rolling through space. This, then, represented the celebration of the sun's birth. Can it be mere coincidence that the Savior's supposed time of birth and this pagan celebration occur not only in the same month, but on the very day? In the fourth century, the church desired to bring the pagan Germans and Romans into its fold. They took the festival of Saturnalia, which was held on December 25, and turned it into a mass of the church. They named it Christ's Mass. Initially, there was a fierce internal fight over this turn of events. The pope bitterly opposed what he called "the introduction of a heathen festival of the Christian church." Even the thought of celebrating the birthday of Messiah was correctly rejected at first. "St. Chrysostom, in a Christmas sermon delivered at Antioch in the year 386 says, ‘It is not ten years since this day (Christmas day on December 25) was clearly known to us.’"
Therefore, if Christmas was not celebrated until fewer than 10 years before 386 CE, it is plain that the first commemoration of the Messiah's birth did not take place before the year 377. 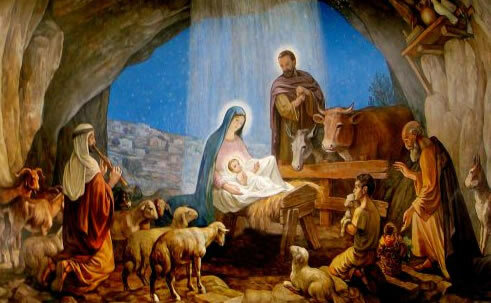 For more than 300 years after His birth there was no celebration of December 25 as the Messiah's birthday. But to appease pagan converts, their heathen celebrations were brought into the church and given new meaning. The customs and practices remained basically unchanged. Once the door was opened to pagan celebrations, the practices and flavor of the early church became more and more heathen. It made no difference whether the Bible countermanded pagan practice. Pleasing the pagans became customary. Candles, bells, round wafers, tonsorial haircuts, crosses, statues, steeples, and many more symbols from paganism are vividly described in The Two Babylons, Loizeaux Brothers publishers. Yahweh condemned ancient Israel for taking up the customs of the pagans around them. He consistently warned them about rejecting Him and His way of life. Israel, however, seemingly had a deep-seated desire to search for any off-beat worship and incorporate that into their worship of Yahweh. The Old Testament is replete with the history of how the Israelites would follow pagan worship around them so that Yahweh had to send a prophet to bring them back to Himself. After such a reformation, the drift into heathen customs would start again. Yahweh would leave them to their own devices, which would usually bring calamity and tribulation. Finally, He sent His beloved Son to this earth. He, too, was rejected. And a heathen custom was established for Him, also. Does the wild revelry that is so common in the Christmas celebration bring honor to Yahshua? Does it reflect His teachings? Or is it rather in keeping with the spirit of a pleasure-mad, fun-seeking people of the world? Yahshua clearly said that He has chosen all His followers to come out of the world, John 15:19. His people are not to take part in the world's heathen celebrations. Perhaps you will say you observe the customs of Christmas for the sake of the children, not for religious reasons. Even though you disagree with the paganism attached to Christmas, it is impossible to join in its celebration without showing that you condone it. Obviously, the central figure in Christmas isn't the Messiah, anyway, but a jolly fat man in a red suit known as Santa Claus. He is the one who receives credit for many of the gifts children receive at this time of year. The average child knows little about the Savior whose birthday this pagan holiday is supposed to commemorate. Everywhere he looks - in stores, magazines, newspapers, television shows - he sees credit passed on to Santa Claus. Most children, like Virginia, come to believe there really is a Santa Claus. What about exchanging gifts? People like to receive gifts, and a principle of being a follower of the Messiah is to be generous to others, right? But is gift giving at Christmas done in the spirit of love, or is it done grudgingly, or to avoid embarrassment? "Yahweh loves a cheerful giver," Paul tells us in 2 Corinthians 9:7. Gift giving at Christmas is often done merely out of feelings of obligation rather than out of love and the simple joy of giving. Children learn to ask, "What did you get?" not "What did you give?" Gifts are given because someone gave one last year and thus are put on the list. It is not really the giving of a gift out of the sheer joy of giving to someone. If you doubt that, don't give any gifts this Christmas and see how many drop you from their list next year. Gift giving is merely a gift exchange. Everything about Christmas is wrong: the name, the time, the purpose, the goal, the result, the worship. How can a True Believer celebrate Yahshua's birthday when nowhere does the Bible encourage, command, or cajole us to remember anyone's birthday? Furthermore, in each of the only three possiblebirthdays mentioned in the Bible, someone died. When one celebrates Christmas, he puts his stamp of approval on a heathen custom, much as Israel did of old, and were punished for it. Let us leave Christmas to the nonbeliever. Say with Joshua, the son of Nun, "As for me and my house, we will serve Yahweh," Joshua 24:15.